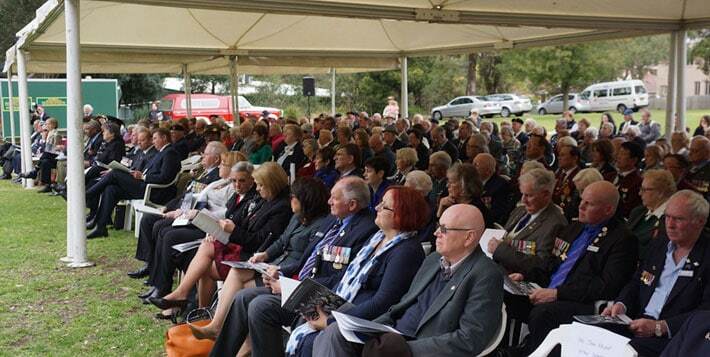 The 70th Anniversary of the end of the Second World War was fittingly commemorated at the Kokoda Track Memorial Walkway on Saturday, 15th August 2015. It was especially gratifying for those attending to mark this important occasion in the company of men and woman who were veterans of the most devastating conflict in human history. As KTMW President, John Haines AM, noted, “VP Day is really their [the veterans] day”. In a clear forthright voice, Lieut. General Peter Leahy AC (Retd) delivered the VP Day Address. As a former Chief of Army, the General reminded those present that while the facts of the War are generally well known, it is the personal qualities and experiences of the individuals involved that add that unique human dimension. Geography reminds us of our place in the world the General noted. The war in Europe is a reminder of where Australia had come from, but the war in the Pacific was a clear statement of our place in the world and where our future lay. General Leahy said that in his address he wished to talk primarily about people rather than the facts about the War which are now easily accessed online. It was those many individuals from a special generation who recognised the perils faced by Australia during World War II. They recognised an evil that had to be confronted, and put service to their country above all else. The General drew attention to Capt. Bede Tongs OAM MM, who died this year on the 14th January. The General first met Bede in Port Moresby in 2002, along with nine other veterans, when the 60th anniversary of the Battle of the Kokoda Track was commemorated. The General recognised a special comradeship amongst the Kokoda veterans. Bede was a poet, and wrote a poem entitled, “What do you say to a dying man” which epitomised the loving care and compassion given to those who made the supreme sacrifice. Members of the ADF serving overseas and protecting the waters around Australia, carry on the great traditions of the original Anzacs as well as the heroes of the Second World War. In his capacity as Chairman of the charity Soldier On, the General recognised the need to assist a new generation of Australian servicemen and women.- acknowledging their service and supporting them as they return to resume their lives in Australia. 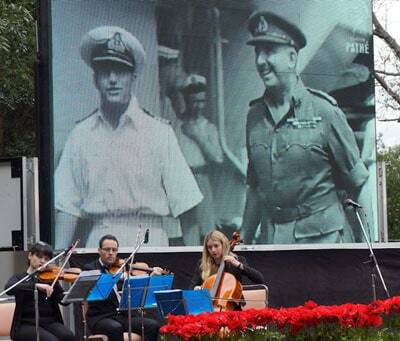 Following the General’s VP Day address, moving footage of the first VP Day and of various Japanese surrenders was screened. While understandable joy was evident on the streets of Sydney, clips taken of debilitated POWs liberated in various former battle zones highlighted the challengers and logistics which confronted those seeing to the specialist needs of our many overseas serving men and women. During this reflection on the end of hostilities, a string trio: Violins (Victoria Jancono-Gilmovich & Leo Kram) and cellist (Nicole Dobosi) performed Handel’s Largo from the opera “Xerxes” and Meditation from the opera “Thais” by Massenet. Soprano Kathryn Zerk then sang “Ave Maria” by Schubert. 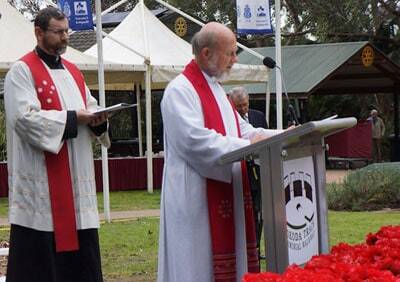 The service proceeded along tradition lines with a wreath laying by dignitaries and prayers offered by the Roman Catholic and Anglican chaplains. 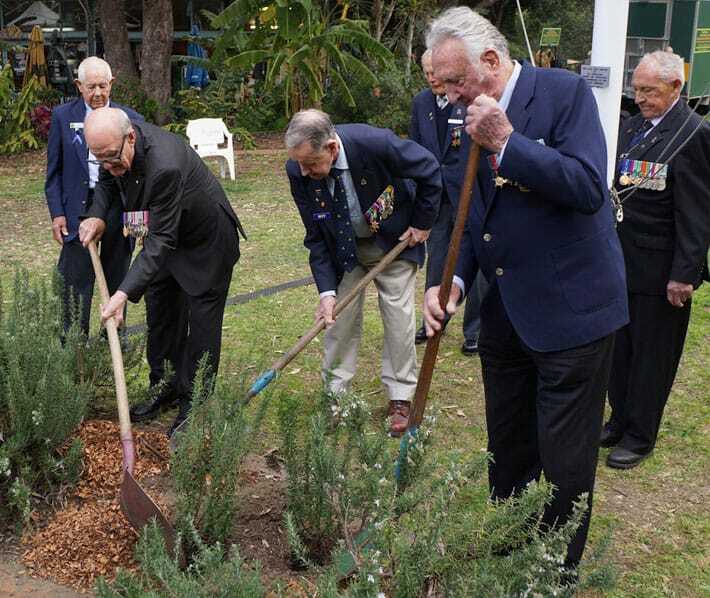 As a special tribute to mark the 70th anniversary of the end of World War II, six veterans planted rosemary, a traditional symbol of remembrance; especially poignant in this the Centenary year of Anzac as it grows on the slopes of Gallipoli.